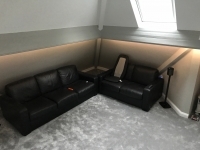 SONOS 5.1, 4K Blu Ray and LED Lighting Solution, Duchy Road Harrogate. This was a simple installation for us, we would need to chase some cable into the wall but apart from that and wall mounting the TV the rest would be simple set up of equipment. 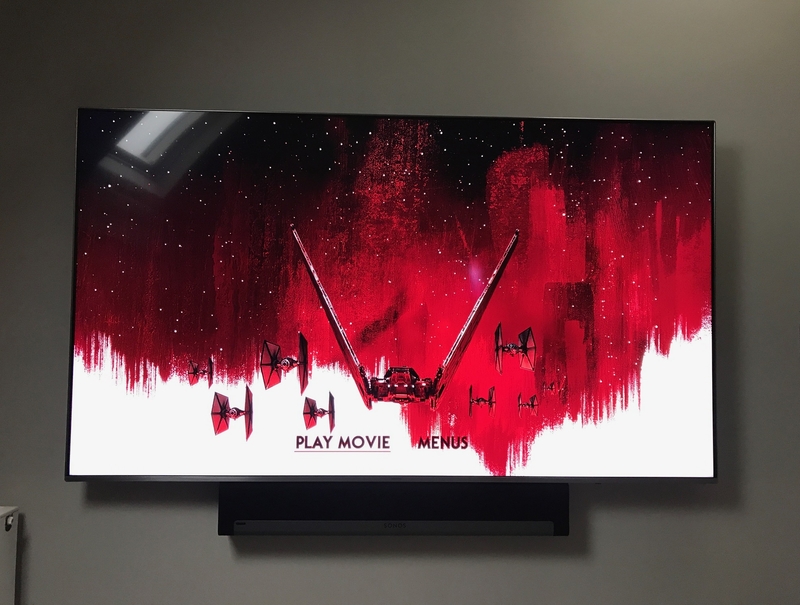 The end result would be an LED solution for two of the four sides of the room, a 5.1 SONOS surround setup and Samsung 75″ smart TV with 4k Blu Ray. 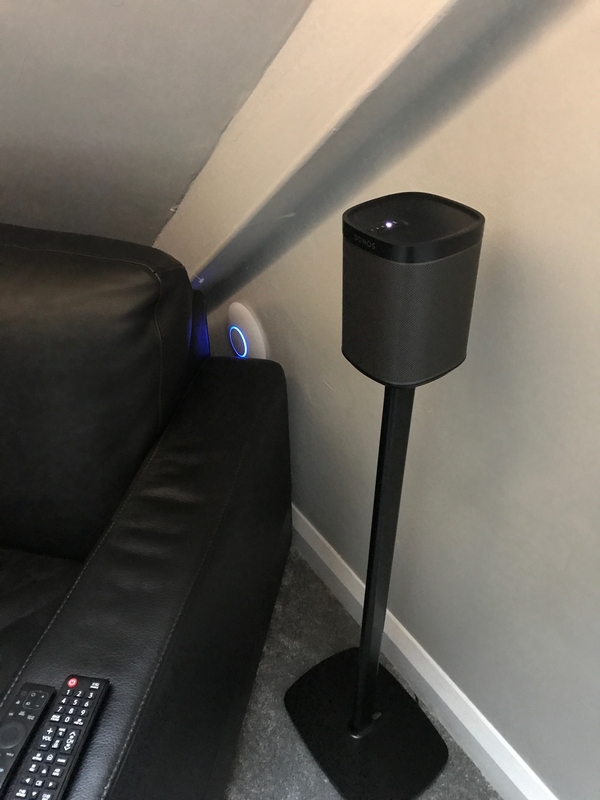 We also decided to install an access point in the room to boost Wifi for smart features on the TV. As is with most jobs cabling comes first. 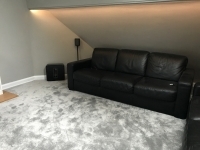 Bringing back the carpet and finding a route up the wall was fairly straight forward, the floorboards worked in our favour with existing traps and joists running in the correct direction. The wall was a bit more tricky as it was red brick so took some work to get the metal back boxes in for power and coax faceplates. As usual once we had plastered the cables into the wall we gave the rest of the day for it to dry and continued the next day after sanding and painting. Day two was finishing touches. One of us started on LED while the other took to mounting the TV bracket. 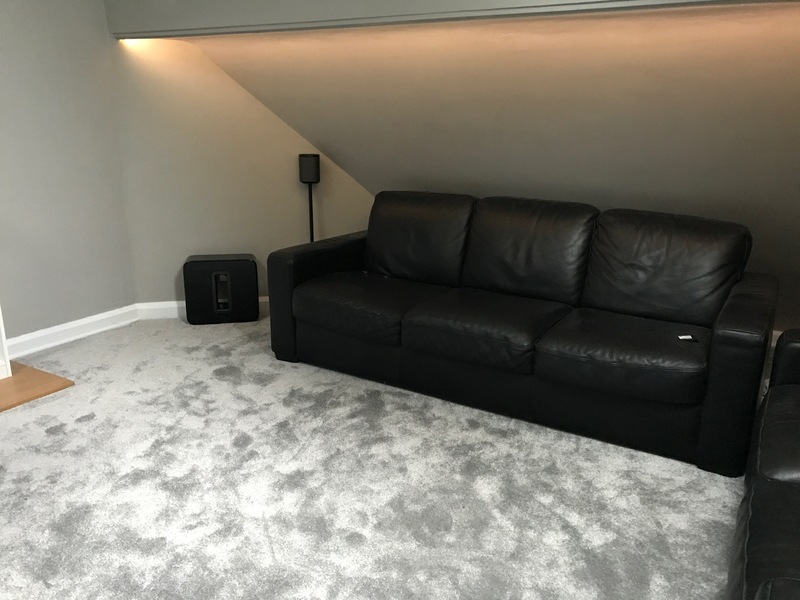 Lastly was setup and registration of the SONOS, 4K Blu Ray and Unifi Access Point (data outlets already in the room led to the network cupboard). The end result was a great sound and picture for a very reasonable price. A great choice for anyone wanting to update from the usual TV speaker setup. The LED was also a great addition to set the mood.